In this guide we’ll be talking you through the exact steps we take when researching our competitors backlinks and the competitors of our SEO clients. It’s not massively complicated to do, you just need the right tools and time. We’ll show you how to use these tools and how to evaluate the backlinks you find. What do we mean by site authority? In pretty much every report on SEO you read, backlinks are always one of the most important organic ranking factors. In all the research conducted that we have seen over the years, backlinks are up there in the top 3 most important factors everytime. Not all backlinks are created equal though. Making sure that links you gain or earn are highly relevant and can be trusted is now more imperative than ever. So you need to make sure you are gaining a real variety of links to your site. Doing research into your competitors and your wider industry will help you invest in the right areas when looking to gain links. The type of content sites are linking out to is great for your strategy going forward. If you can replicate that style of content and make a better job of it you should be able to gain links from other sites similar to those linking to your competitors. There's a number of tools on the market to help you do this. Our favourites are Serpstat and SEMRush. Both these SEO tools do a very good job at providing link information and make is really easy to export the information and manipulate it. They will provide you with all the metrics you’ll need to make an informed decision on whether to add a specific site to your list of outreach targets. For this article we’ll be focusing on Serpstat backlinks checker and how you use it. The first thing you want to do is to find out which competitors rank above your website in the search results for your chosen keyword or search query. To make sure you do this without any personal cookie settings being used on your web browsers we suggest using the Google Chrome Incognito window to search Google. Firefox also has a function similar to the Incognito window but it is called “private window”. On Google Chrome you will find the Incognito window by clicking the 3 dots on the far right of the address box, the same place you would change settings, add extensions etc. You can select “New incognito window” from the dropdown menu. Once your new window opens, enter the Google URL specific to your country, we’re google.co.uk. Enter the keyword you are looking to rank for and this will give you a list of all the competitors you want to be checking out the backlinks of. 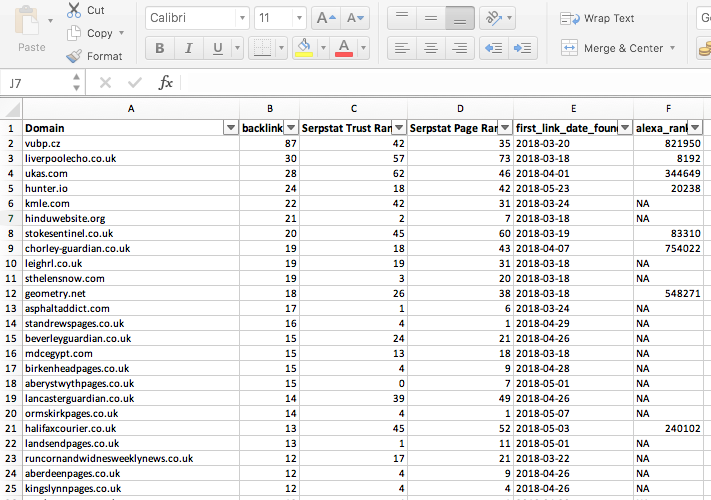 Once you have a list of competitors URL’s you want to find the backlinks for we can then go to the Serpstat front page. Enter the competitors URL into the search box and click search. We’re going to use the website www.edp-uk.com for this example as we know they have a good backlink portfolio. You will land on a page which is a domain overview (great for all types of SEO research and PPC research too!) but for backlinks you want to select the “Backlink Analysis” tab from the menu on the left hand side of the screen. This section is an overview page which gives you the top level statistics for each section. Amongst other bits of information this area shows you the Page rank and Trust rank of the URL you entered. In our opinion and many others if you can have a trust rank higher than your page rank its a good sign that your website is moving in the right direction. This section will go into details on the top level referring domains that are pointing at the URL you have entered. Some of this information is the most crucial when you analyse competitor backlinks. You have to be able to look into which links are giving them link power or link equity and which ones are not. Even more importantly, you don’t want to go out building links that are not going to help you rank higher or even worse might get you penalised by Google. The referring pages section breaks down the actual pages which contain the backlinks. This is great when you are researching the type of sites you need to be gaining links from and the type of content which is proving popular for your competitor. It can really help you with your link building strategy. Does exactly what it says on the tin really. This section will give you a breakdown of all the anchor text for the URL in question. Along with the estimated link flow metrics for you to gauge whether or not you need to be competing on a similar anchor text and the best way to go about it. Anchor text ratio has never been so important so this information is like gold dust when used in the right way. Lists all the pages on the website in order of the most amount of backlinks. This will also allow you to export the information into excel where you can manipulate the data to your heart's content. A great way to do this is to filter by flow metrics and see which pages are likely to rank higher than others. Once we have gone through the above and can now use the backlink analysis section. The process is reasonably simple but is a job which is not quick to do. And you need to keep a keen eye on the data. Sadly, one flaw with Serpstat is that it still doesn’t give you the option to filter the links by the metrics within the software itself. As a default it shows the referring domains at the top that refer the highest number of pages to the site. This is not the best way of doing it in my mind, just because a site has more links it doesn’t make it the best domain to gain links from. Instead we export all of the information into excel. From there we will use the filter option on the top row which contains the titles. The information that is exported includes Domain, Number of backlinks, Serpstat Trust Rank, Serpstat Page Rank, the date the link was first found and the Alexa rank for the website. In the image above we have made the titles bold and increased the font size to help read it better. By filtering the information you can sort the columns by either the Page Rank or Trust Rank. The one we always look at first is the Trust Rank. This is because it gives you a better understanding of the topical relevance of the links. Select the top ones, we normally look to build a list of websites that have a trust rank or page rank above 30. This does completely depend on the industry too as you may need to build a much stronger backlink profile to compete in your SERP. Perfect example is the SEO industry. SEO services is probably the hardest to compete in as most people looking to rank for it are normally working in SEO themselves. Alexa rank is also something to look at. The alexa rank is based on the most popular websites online. A site in the top 1 million should be able to generate you traffic just by them linking to you, whether they are dofollow backlinks or no-follow backlinks. So we have all the of the information on where your competitor backlinks are coming from. Why should we worry about this? Well one of the main ranking factors to Google, Bing and other search engines is site authority. If you were looking for someone to replace your UPVC windows on your home before the internet existed and possibly still now, the first place you would go is to a friend or a trusted source to recommend a UPVC installation firm to you. This recommendation would carry more weight if you trusted this person, they were a close friend or a trusted figure in your mind rather than a random bloke who you had never met in the pub who just told you they were great. If you then hear the same thing from family members, other close friends and trusted people then it gives the recommended company lots more credit and psychologically gives you permission to make a purchase with them or to at least get a quote. It works in very much the same way with backlinks and your backlink profile. The more backlinks from trusted and relevant sources the more credit Google and other search engines will give you when looking where to rank you against your competitors. The more relevant, topically trusted backlinks you have to your website, the better the websites authority or domain authority. If you know you need to build more links and want someone to help then get in touch with us or find out more about our link building services here. Thanks for sharing this blog This blog describes how to check the competitor backlinks.It has been explained about some tools that allow you to check the compatibility backlinks. Hi, a very nice article. Quite helpfull for me.